Plants can provide a softer, more natural, and more attractive border between houses than a privacy fence. Before landscaping property lines, always make sure you know precisely where the boundary lies (if unsure, hire a surveyor). While you are at it, research the possible existence of any easements where planting may be restricted. It is not difficult to see why evergreen shrubs would play a critical role in landscaping property lines. By definition, evergreens provide foliage to admire all four seasons of the year. And that same trait enables them to offer something else: year-round privacy. Just because they are called evergreen does not mean you are restricted to the color green with these landscape workhorses. 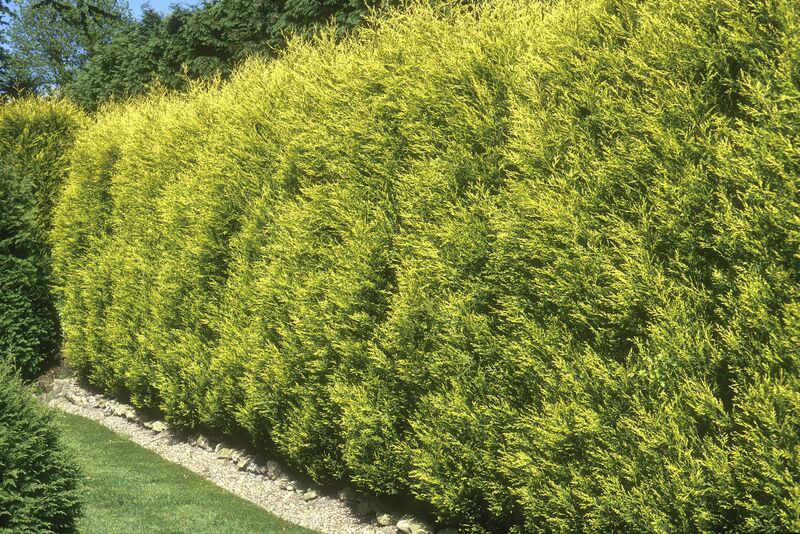 And depending on your tastes and goals, evergreen shrubs (or deciduous ones, for that matter) can be planted in hedges that can be trimmed, planted in rows and left untrimmed, or grown in mixed borders. Mixing evergreen and flowering shrubs can be an ideal solution for a property border, providing both privacy and a great-looking barrier. You can grow enough evergreens to block the public's gaze (year-round) while injecting enough color with flowering shrubs to keep your own eyes constantly stimulated. And you do not have to stop at planting shrubs alone. Why not mix in long-blooming perennials and other plants to create a feast for the eyes? Stir up the pot in your mixed border even further by using some tall ornamental grasses. Two of the best are maiden grass and zebra grass. For gardeners in colder climates, ornamental grasses offer the added bonus of providing interest to your border planting during the winter months as well as summer. Another benefit is that they are low-maintenance. Bamboo is also a member of the grass family and is increasingly used for property lines and as a privacy screen. However, some types of bamboo are invasive, so you have to know what you are doing before planting it. A hedge of holly shrubs will not keep a burglar off your property, but the barbed leaves on many hollies are not exactly comfortable to brush up against. This and the prickly look of holly leaves should be sufficient to keep all but the most determined of would-be trespassers at bay. 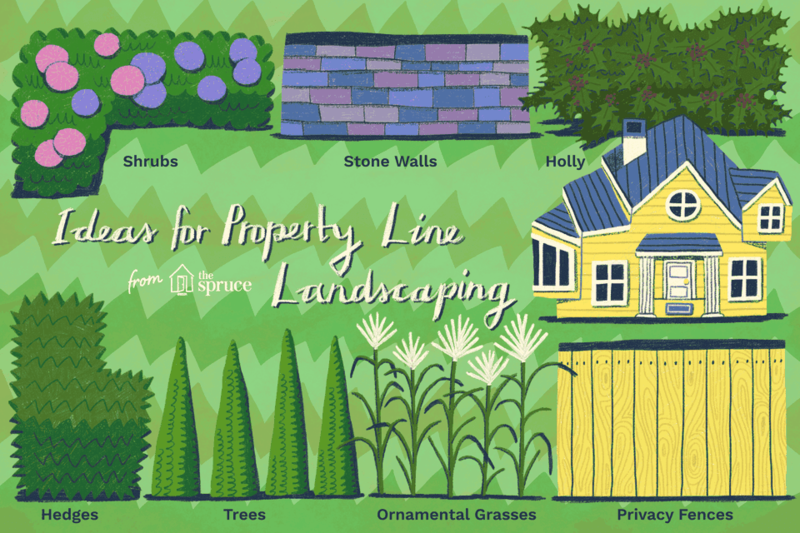 If you crave privacy but are not a fan of fences, and you like the neat appearance of straight lines and even surfaces, a hedge can satisfy all your needs. It is a plant-based solution that gives you all the formality and crispness of a hardscape feature. You should know that maintaining hedges so they are neatly trimmed can be a lot of work. In addition to shrubs and ornamental grasses, a popular plant choice in landscaping property lines is trees. Not only can trees offer privacy, but they can also form windbreaks. If you live in a windy area, planting a windbreak on your boundary may be eminently practical. An example of a good tree for windbreaks is the Colorado blue spruce tree. Arborvitae is another popular tree for windbreaks. Arborvitae is smaller and somewhat more decorative than classic evergreens like blue spruce.